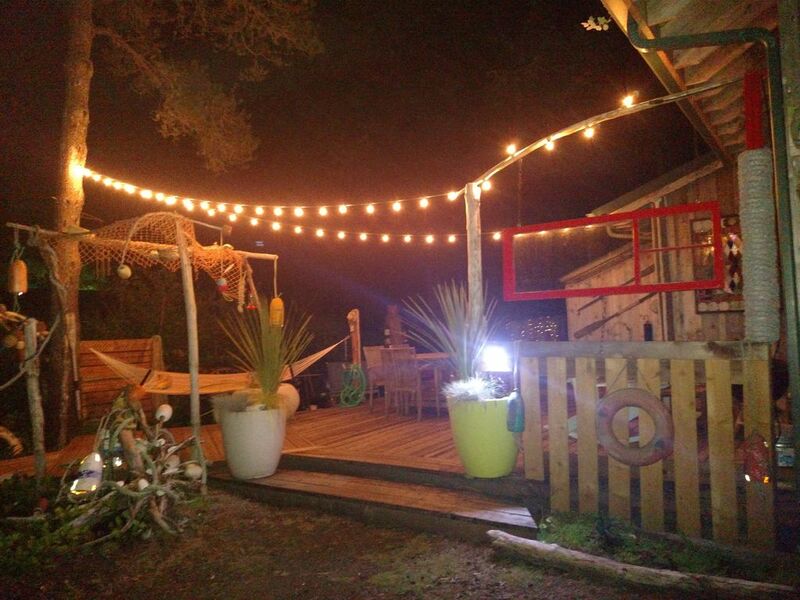 Comfortable Cabin Close to the Beach - Come relax & unwind - Experience nature! Welcome to Cabana Sea Esta - This is an upscale cabin nestled in the woods yet close to the ocean. It truly offers a unique experience getting you in touch with nature and the opportunity to relax and unwind at the coast. Hear the ocean roar, the birds sing, the trickle of the water feature, the trees sway and the wind chimes while resting in the hammock, having lunch on the deck, s'mores around the fire pit or tossing a game of corn hole. The cabin sleeps 7 guests in 2 comfortable bedrooms and the sleeping loft on the upper level and offers a very comfortable and open layout. The floor plan is very open and inviting and one that naturally creates people being together and enjoying time together. The great room features a towering vaulted cedar lined ceiling with a wall of windows bringing in light and allowing for viewing of the woodsy environment. As you walk up to the home you are greeted by the large deck space but we'll get to that more later.....Entering you will see the open and fully stocked kitchen. The kitchen has modern appliances and a breakfast counter. Quality dishes, glassware, pots/pans, knives and small appliances such as coffee pot, blender, crock pot and toaster are offered. Just outside the kitchen is the dining area which comfortably seats 6 people. The great room is completed by the living room. The living room offers quality furnishings, a flat panel television compatible with Netflix & Amazon and a wood burning stove (wood provided). The great room has a wall of windows and a super tall cedar lined vaulted ceiling - really a nice feel to it! The two bedrooms are located on the main level. Each features a new mattress and linens on the queen sized beds. A full bathroom with tub/shower are on the main level. A second bath is also on the main level. This has a half bath inside and access to our private outdoor shower with hot/cold water. Let the dog in or out directly from a side door leading to the fenced dog area - very convenient arrangement! In the loft area you will find 3 twin beds, again with new mattresses and bed linens. There is a kids area with bean bag chairs and games. Next to the loft area is the media room. Here you will find a comfortable couch and love seat and a second flat panel television, also compatible with Netflix and Amazon. The outdoor space is an extension of the living area. The large ground level deck offers a conversation area, dining for guests with quality furnishings, buffet counter, a charcoal grill and sandbox with toys for the young ones. A hammock sits just off the deck in the garden area. There are multiple locations to grab a book and relax outside. From the main deck you take a short stroll to the fire pit area. This area features seating, a fire pit and buffet counter to hold those s'more fixings. Bring the guitar for the campfire songs! Our private outdoor shower with hot/cold water is accessible from the house - another option to get in touch with Mother Nature while visiting with us at Cabana Sea Esta. The grounds are landscaped very nicely with a real nature setting yet close to the beach. Your well behaved dog is welcome. But first please contact us so we can briefly discuss your 4 legged friend. There is a fenced dog area off the back door - very convenient to let your dog out right from the living room. We cater to families and friends seeking a relaxing time at the ocean. We are NOT a party house. If a place to party is what you are after please consider other housing which would be open to your needs. It is critical for our home to be a good match for us and for us to be a good match for our guests. When you contact us please include information about your guests and what brings you to the coast and potentially visiting with us. We offer 2 flat panel smart televisions each with cable. Use your Netflix or Amazon account with the TVs. The cabin has wireless internet. There is a landline phone for local calls and cell phone coverage can be spotty. We have Verizon and are able to get reception. We are unsure of other cell phone carriers. We offer a quality selection of both adult and kid movies. Board games and reading books are also supplied. Ready to reserve or have any questions? If so please use the 'book it now' feature on the VRBO listing. Here you will enter your reservations date, number of guests and if you are bringing a dog or not. There is a place to enter a message to us. This is where you can include information about your guests and your dog, if applicable. If you have questions before using the 'book now' feature please email us and we'll get right back to you. Or you may call us. at VRBO #687120 - a larger single family oceanside home or VRBO #954618 - a cozy home located within walking distance to the beach and restaurants. We take great pride in offering quality homes for our guests. We are frequently in the area doing maintenance and updates to the homes. Many of our guests are repeat guests who have stayed with us multiple times at different locations. We love the feel of this home - both inside and out. The setting is so peaceful. It's like camping in the woods at a nice cabin but you can hear the ocean too! The great room with the towering ceilings, wall of windows and wood stove creates a space which attracts people and conversation. The outdoor space is unique - lots of outdoor living space and a nice blend of flowers, shrubs and trees mixed with a nautical feel. Some guests are hesitant to use the outdoor shower but those that do find it very refreshing - a steamy hot outdoor shower on a cool morning! The mix of nature and beach at this cabin is a unique blend not found at many homes on the coast. The home is unique in that a couple staying at the home won't feel lost yet the home easily accommodates 7 guests. Very NICE - better than the one we have at home! Dining table holds 7 people plus 2 stools at the breakfast counter. 2 flat screen tvs - both Smart TVs - use your Amazon or Netflix account. Dish Network is on both tvs. Enjoy the music channels on the Dish Network guide. While we are not handicap accessible the main living areas are mostly on the lower floor. To access the deck there are 2 steps and then one more step to get into the home. Once inside the home you have the bedrooms, bath, kitchen, dining and living room all on the main floor. Plenty of things for our family with 2 teenagers to enjoy. The fireplace was toasty warm and we enjoyed relaxing with movies or books. There is a good choice of movies available - both downstairs and in the loft. The loft is a great hangout for teens as well as younger kids. We cooked great meals in the well stocked kitchen - don't forget to bring your own condiments, staples, and coffee as these are not provided, although there is a selection of spices. And the taffy that is provided is yummy and a lovely touch. Our dog (lab) enjoyed the outdoor doggie area, runs on the beach, and there were plenty of doggie treats provided! The outside looks amazing, although we didn't get to enjoy it due to the weather-will have to return in the summer when the weather is warmer and dryer. This was our second visit, and we will definitely return again (and again). The property was quiet and cozy! We loved every second of our stay!! This home was perfect for our Christmas celebration! It was warm and cozy and the owners thought of everything we might need, from the loft and TV room for the kids, to the firewood they provided and all the equipment we needed to bake cookies for Santa! There were even treats for the dog! The weather wasn't the best for beach combing, but we had fun exploring the cranberry museum and the town of Westport. We hope to be back soon! Loved the house. Plenty of room for Dogs and Family. Our Grandchildren were so excited! They had their own TVRoom, bedroom, variety of movies. They were in Heaven. The Outdoor area would be amazing in the spring/summer. We will come back. The fenced doggy area Perfect. It stormed and rained but we were very comfortable at the Cabana Sea Esta! We were pleased with the house. Only suggestion I’d make is kindling for the wood stove. House is very well stocked, clean and comfortable. Owners were very responsive and helpful. We would definitely stay here again. Such a fun and awesome place to stay, even on a rainy day. Everything provided just bring your clothes and food. Loved the whimsical outside items tucked away here and there. Comfortable beds and everything is clean and neat. Brought our own firewood for out side hot dog roasting, but there was plenty there to use also. We will recommend and be back. Our cabin is located in Grayland, just south of Westport. There is a grocery store within walking distance with the various shops, restaurants and bars in the Grayland/Westport area a short drive away. There are beach access roads for driving just south and north of the home. This beach area is great for razor clamming. It is important for us and our guests to be a good match for each other. When contacting us please provide a tidbit about your guests and what brings you to the area. Falsification of number of guests and/or pet information voids reservations and forfeits all money paid.